On December 3, David Saint-Jacques will launch with two crewmates from the Baikonur Cosmodrome in Kazakhstan on a Russian Soyuz rocket to the International Space Station. 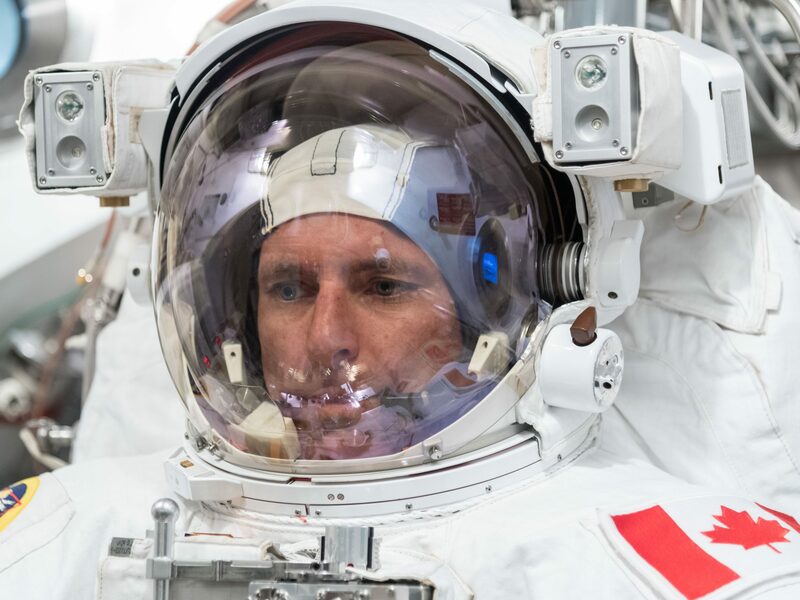 David will spend six months aboard the Station as part of the ‘C3’ expedition, Canada’s third long-duration mission. Preparation for an ISS expedition is a significant undertaking requiring the talents of thousands of people from around the world. Part of the Canadian Space Agency’s preparation for the Saint-Jacques mission is readiness for a bad day in space. A bad day could occur at any time — from launch to landing or anytime in between — and without warning. It could involve a spacecraft accident, a major system failure, or even injury or death of David. Last month’s failed separation of a Soyuz booster rocket during launch and the ensuing mission abort by the crew was worrisome. It underscored the reality that spaceflight is complex and risky. Assignment of a response team and development of an action plan is a first step in contingency readiness. A CSA Contingency Action Plan has been written to support David, his family, Agency staff, federal government officials and the media in the event of a crew crisis. The steps outlined in the document have been developed such that the actions of the contingency responders will be prompt, correct and coordinated. I was at the Canadian Space Agency headquarters in Montréal last Monday afternoon to lead a C3 contingency simulation. While the development of a Contingency Action Plan is a necessary step, it is not sufficient. The soundness of the Plan and the responsiveness of the team must also be evaluated. Simulations (‘sims’ in astronaut lingo) are training opportunities for the response team to learn and refine the skills that would be essential on the day of a real crisis. They provide a safe environment where mistakes can be made — a very effective way to learn. I previously met with CSA colleagues Jason Dyer and Tim Braithwaite to decide upon learning objectives for the C3 team. I then developed detailed scripts for a series of contingency sims. At Monday’s sim, I led the team through a training scenario associated with a launch crisis. Functioning as the ‘simulation supervisor’, I controlled the general direction that the sim took by periodically issuing ‘green cards’ to team members. 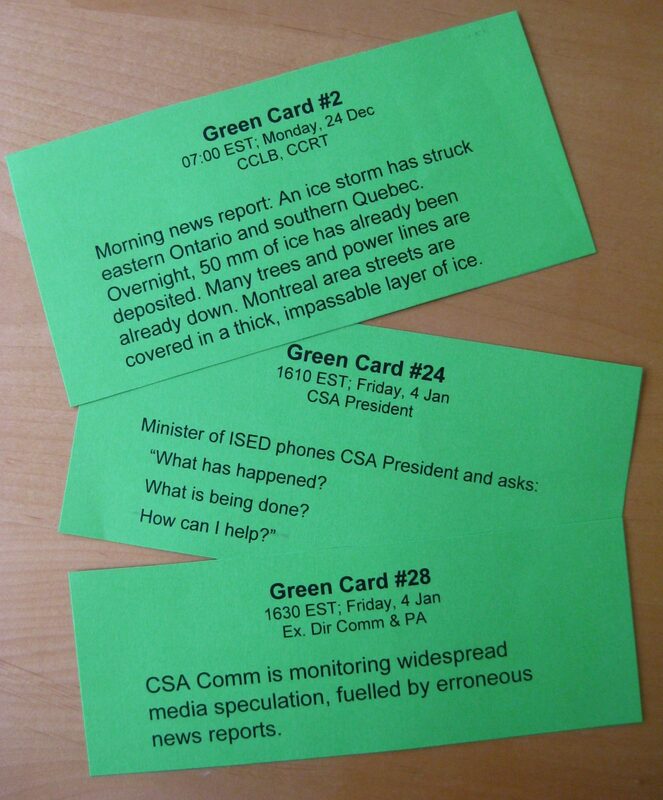 A green card introduces a new event or mishap into a simulation scenario that requires a response team member to exercise their role and responsibilities. Developing a script is devilishly fun – a bit like writing the screenplay for a Hollywood movie! Sims often feature high drama. I take satisfaction in a script if each participant has been emotionally as well as mentally engaged in the exercise. At the end of the day, we debriefed. Lessons learned from the sim were shared by all participants. What went right or wrong? What additional resources would have been useful? How could we better coordinate amongst ourselves? The answers to these questions are incorporated back into the Contingency Action Plan to assure that all processes will unfold smoothly and address all issues on the day of an actual crisis. Contingency planning is definitely an iterative process. Any organization with key personnel and strategic objectives can benefit from contingency planning and simulation. Organizational crises occasionally arise – product failures, natural disasters, data breaches – and can potentially wreak havoc on the business and threaten the well-being of employees. While it is impossible to predict the nature or timing of these crises, they should be expected as part of the normal course of doing business and as inevitably as death and taxes. Last week’s C3 sim was our second, dealing with medical emergencies that arose at the Baikonur launch site. Our first sim was held several weeks earlier and dealt with a rapid depressurization incident aboard the Station. A couple more sims will be conducted in the coming months to keep everyone’s skills sharp. I cannot say how the Saint-Jacques ISS expedition will unfold. What I can say is that if something goes wrong, CSA personnel will be well-trained, confident and resourced to respond quickly and appropriately. On the day when it will count, the Agency will be ready. Astronauts, Collaboration, Culture, Education, Exploration, Exploration de l'espace, Failure, Innovation, International, International Space Station, Lifelong, Organizational Behaviour, Space Exploration, Spaceflight, Teaching, Teamwork, Training astronaut, Canadian Space Agency, contingency planning, David Saint-Jacques, expedition, International Space Station, NASA, preparation, simulation, space, space exploration, spaceflight. permalink.